Montreal Canadiens general manager Marc Bergevin said earlier this month that he didn’t expect to give up valuable long-term assets for rentals on expiring contracts to help this club push for a playoff spot. With the Canadiens now sitting in the top wild-card spot in the Eastern Conference and equal in points with the Boston Bruins, TSN Hockey Insider Darren Dreger wonders if Bergevin might still look into upgrades for the immediate future. “I think that Bergevin is being sincere in his want and his reluctance to trade away either prospects or draft picks,” Dreger explained to TSN Radio 690 Montreal on Thursday. “You’ve got to continue to stock the cupboards and utilize your draft to your strengths and to your advantages. So I can appreciate that. “I guess the one thing that I would question though is given the success of the Montreal Canadiens, if a player of interest is attainable, why wouldn’t you got out and add that piece? At some point here in the near future – believe it or not, it’s relatively early. 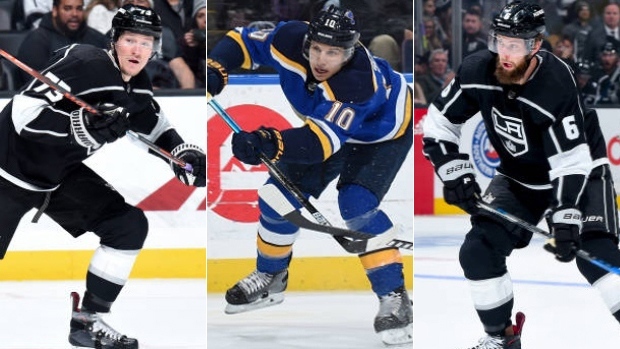 I talked to L.A. last night and the message I got back from the L.A. Kings is it’s still very quiet and that shocks me because you look at the pieces that the L.A. Kings are willing to part with; Tyler Toffoli, Jake Muzzin’s name has been out there for a long-time. In fact, it’s probably easier to say who they’re not willing to part with, which sounds like it’s pretty simple. It’s Drew Doughty and Anze Kopitar and then after that it could be just a fire sale for the Los Angeles Kings. Dreger: How active will Bergevin really be ahead of trade deadline? Are Claude Julien and Marc Bergevin strong candidates for individual awards at the end of the year? Will the Habs GM be looking to add talent to his current roster before the NHL trade deadline? “So if I’m Montreal, or I’m any other team for that matter, I’ve got to be able to figure out how Tyler Toffoli can help me on the wing. Or, there’s rumblings of Brayden Schenn in St. Louis being available with only one year remaining on his contract, he could certainly help the Habs, or all the defensive pieces that are either in play or soon to be in play. In Los Angeles, Toffoli, 26, has seven goals and 17 points in 47 games this season, while Muzzin, 29, has four goals and 20 points while averaging 21:33 of ice time per game of the Kings’ blue line. Both are signed through next season. Schenn, who carries a $5.125 million cap hit through next season, has nine goals and 24 points in 41 games with the Blues this season. Edmonton Oilers forward Jesse Puljujarvi was ranked at No. 14 on Wednesday’s TSN Trade Bait board and it’s been suggested the 2016 fourth overall pick could be traded as the team looks to push for the playoffs this season. According to TSN Hockey Insider Bob McKenzie, however, the Oilers are in no rush to move the 20-year-old winger. McKenzie told TSN Radio 1200 Ottawa on Wednesday that the Oilers are listening to offers, but not actively shopping the young forward. He noted, however, that the team’s first-round pick, which was listed at No. 5 on the Trade Bait board, is expected to be in play ahead of the deadline. “I don’t think there’s any question about that,” McKenzie said. “If you like to play general manager, pretend you’re general manager Peter Chiarelli of the Edmonton Oilers. Look at their lineup, as it currently exists, and you see the holes – everybody sees the holes – they need more scoring, they need help on the blueline. And then you ask yourself, ‘What pieces could you possibly move that would fetch a significant return coming back the other way, an impactful return, coming back the other way. “Once you get by the notion that you’re not, under any circumstances, trading Connor McDavid or Leon Draisaitl, and you would prefer not to trade Ryan Nugent-Hopkins, there’s not a lot left. And you don’t want to move Darnell Nurse because you’re already shy good, young defencemen. So what could be in play? Well, the first-round pick could be in play. Maybe Jesse Puljujarvi, their first-round pick from a few years ago, could be in play. Puljujarvi has four goals and seven points in 36 games with the Oilers this season. He had 12 goals and 20 points in 65 games with the team last season and will become a restricted free agent in July. TSN Hockey Insider Darren Dreger reported Tuesday that the “expectation” is the Pittsburgh Penguins will trade Derick Brassard ahead of the trade deadline. According to Aaron Portzline of The Athletic, the rival Columbus Blue Jackets are interested in Brassard and have had trade talks with the Penguins. Portzline notes that the Blue Jackets have a need at centre, but working a trade with their Metropolitan Division rival could prove difficult. The Blue Jackets dressed Pierre-Luc Dubois, Alexander Wennberg, Boone Jenner and Lukas Sedlak at centre for Tuesday’s 4-1 win over the New Jersey Devils. Centre Brandon Dubinsky has missed four straight games due to a lower-body injury. Dreger reported that the Penguins are looking to get at least a third-line centre in return for Brassard in a trade. Brassard was traded to the Penguins last February in a three-team deal that sent to Ryan Reaves to Vegas and Pittsburgh’s first-round pick in 2018 and third-round pick this year to the Ottawa Senators. He carries a $3 million cap hit since the Golden Knights retained $2 million of his salary last year. The 31-year-old, who spent the first six seasons of his NHL career with the Blue Jackets, has eight goals and 14 points this season. Columbus (28-15-3) currently sits first in the Metropolitan Division with 59 points, while the Penguins are only three points back of the Blue Jackets, but are currently in the second wild-card spot. Columbus Blue Jackets goaltender Sergei Bobrovsky moved up to No. 6 on the trade bait list following last week’s “incident” which saw him scratched for one game. Bobrovsky’s future with the team is murky after the goaltender refused to enter into extension talks last summer, but TSN Hockey Insider Darren Dreger reports that the Blue Jackets still plan to hold on to the Russian netminder for their playoff run. “I would say very little from the Columbus Blue Jackets’ perspective because of where they’re positioned in the standings, and the fact that they believe they are a contending team,” Dreger told NBCSN on Wednesday night. “It wouldn’t make any sense whatsoever to move out a piece like Bobrovsky, a two-time Vezina winner, a guy who gives you a chance to contend for that Stanley Cup. “Now, there was some talk of that in the off-season, but there were multiple conditions – at least that’s my understanding – that would have had to have been observed. I think that Sergei Bobrovsky wants to win. I think he’s committed – at least in-season – to the Columbus Blue Jackets. The 30-year-old has started one of the team’s three games since being scratched last Thursday and has a 19-13-1 record this season with a 2.94 goals-against average and a .903 save percentage. Backup Joonas Korpisalo has won his past three starts, bringing his record to 9-2-2 with a .902 save percentage and a 2.94 GAA. Bobrovsky is one of two pending unrestricted free agents on the Blue Jackets, along with leading scorer Artemi Panarin. Panarin, who has 18 goals and 52 points in 44 games, also declined to enter into extension talks with the team last July and is listed at No. 44 on the Trade Bait board.